With only 547 examples made, the Buick GNX is easily one of the most sought after American cars of yesteryear. The GNX had the performance to go along with its devilish good looks, packing a 276 horsepower turbocharged V6 under the hood – which made it faster than even the Corvette at the time. 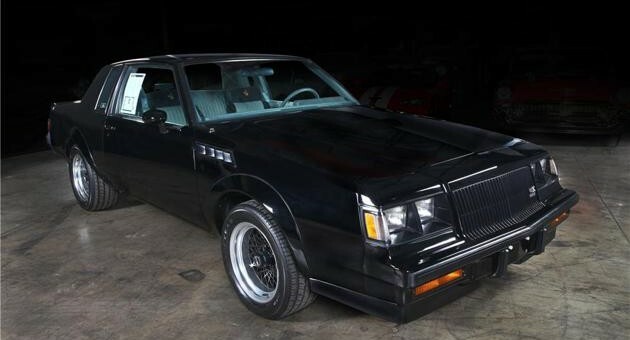 These all-black monsters are hard to come by in good shape, which might explain why this mint 1987 GNX fetched $106,000 at Barrett-Jackson’s recent auction in Scottsdale, AZ. The car just so happens to be the lowest mileage GNX in existence, having only traveled 11 miles since the Miller Beer Brewing Company bought it and stashed it away in 1987. Prior to its sale at Barrett-Jackson, it was part of the Michael Jenkins Collection. Sporting serial no. 442, this GNX looks like it has been stuck in a time capsule since 1987. It still has the original window sticker, as well as the original invoice and purchase order. It hasn’t even been washed since it left the dealership more than 26 years ago. The GNX might just be the coolest car Buick ever made and ever will make. That is, unless they produce another black two-door wearing the GNX nameplate, which they trademarked once again back in 2012. Such a waste not to drive a car like this. Some people think low mileage has real value They are wrong. Someone who really valued this car would’ve put 1000 miles on it in the first week. Say that to the guy who sold the car for 3.5X it’s sticker. Low mileage matters, even more so on limited production cars. It’s a genuine, quantifiable, metric of the amount of wear a car has endured, and nobody is going to ignore it when they buy a car; be it a GNX or a cruddy Dodge Caliber. So many people put cars away anymore hoping to have the next Shelby and this is one of the few that has paid off. The truth is there is a lot of value in a low or no mileage car anymore as so many of these cars are very difficult, too expensive or just impossible to restore anymore. There are really repo parts for a car like this and also they are only original once. Often people who put them away are collectors and speculators so it really matters little if they drive it or not. The real shame is for the guy who bought this as if he drives it the car will lose the one value it can never get back little to no miles. I saw a guy pay $16K for a 84 Fiero that if he drove it the car would be just another average Fiero with little value. In this case it would still be a GNX but not a six figure one. It is in all just what you want. I would rather have a 89 Turbo Pace car anyways. This has been one of the real sleeper cars of the 80’s that will see big increase in value later on. It has a lot going for it. The GN engine in a F body and a pace car all in one. I agree cars should be driven not sitting in a garage! oh, it was driven… .5 inches in that garage, and in reverse to rollback the odometer. Beautiful Auto ! I have a question , did Buick put those vents on the top rear of the fenders or did someone put those @#% AWFUL stick- on fake plastic vents on it ? I gotta believe the owner would do such a thing ! it was to protect you from higher insurance rates. There was nothing and I mean Nothing that was gawd awful about a grand national! The fact is the vents while stated for cooling really were more to set the car apart from the normal GN just as the fender flairs and bigger tire package. What is sad is the HP on this car today is so average. I remember back in the day this was the killer car to have and today my 2.0 4 cylinder HHR has 14 HP more and even more torque. This is not a knock but the truth is we really though the higher HP in the 80’s was such an improvement over the 70’s and never imagined GM with engine like in the V sport CTS etc. Hell even the base cars today have more hp then the early 80’s Corvettes with only 2.5 liter 4 cylinders. I am just glad Buick fixed the Turbo engines as the early years were a mess with the non water cooled housing. It was like clock work a T type or Turbo Monte Carlos would puke a Turbo bearing at 30K-35K. The water cooling and intercooler should have been there from the start. Please consider http://www.timelessautosales.com when selling a classic, vintage, or muscle car. Lets face it, it’s not the easiest thing in the world to sell a classic vehicle on your own. Our unique service will give you all the control of the sale while doing all the leg work for you! Our one-stop-shop will connect the classic car community directly to your doorstep. Advertising online is an attractive option. It can be an inexpensive way to get your car in front of a large number of potential buyers. Have trust in Americas #1 online service for selling antique, classic, and muscle cars online. ​Our professional marketing staff has full time appraisers on hand to completly evaluate your vehicle based on your vehicles year, make, model and conditon. If you would like a free appraisal just ask and we’d be glad to suggest a starting price for you. Our goal is to help you achieve top dollar for the vehicle so don’t hesitate to ask! ​Allow our advertising specialist to create a profile of your vehicle. In order for us to showcase your vehicle to collectors we’ll need as much information to attract the right kind of buyer. Whether it’s a trophy winning car, or a father and son project, please share as much as you can. ​ The number one reason people in the classic car community love our service is because of our one time low fee and how effective we are. For a flat fee of only $299.99 we will advertise, market, and promote your vehicle on premium classic vehicle websites and networks for you. This service also includes our award winning buyers GUARANTEE! I used Timeless Auto Sales during the winter, I was discouraged when my car didnt sell. But when I called back the lady from customer service reminded me that I can renew my 90 days for free. Since it was free I decided to let them try again, and my car sold in about a week! It was awesome. When Im done with my current project, I’m going to use them again! Timeless Auto Sales is ok. I used them last year but it took a while to sell my car. I guess it might be because I live in the middle of nowhere LOL. Im about to put my 68 Mustang on the market and will probably use them again. Yeah they are good too. My father passed 3 years ago and I used their website service to sell the T bucket he left behind. I think they only do classic cars though. “My husband signed up with you guys last month and I just wanted to say that you folks were very professional and worked with us through the whole sale. “We just sold the car!! Thank you Phil for doing our ads and walking us through the process. We never knew the car was worth so much. We wound up getting $32000 for the car! Maybe we will buy a car from you in the future. “I just wanted to come online and post about the service. I sold the mustang last night and I could not be happier. I was trying to sell that car for over a year and I never realized how big the world wide web its lol. Times have definitely changed. “WOW what a good service! Sold my Camaro an hour ago and I could now thank you guys enough. Within one week of signing up I got my car sold and I got exactly what I was looking for. Will def use your service again once I fix up my next project. “My grandma just sold her car this morning to a high end collector in Green Bay!